Almost Hidden from view beneath the overgrown folige below Solcum Aylesbury hillfort lay the historical Second World War Drakelow Tunnels. The Drakelow Tunnels originally called "Drakelow Underground Dispersal Factory" have been kept shrouded in secrecy up until as recently as 1993, as this was once a former underground military complex beneath the Kingsford Country Park near the village of Kinver, Staffordshire. These pitch black disorientating tunnels, which have a total length of 3.5 miles have a very interesting past and are a historical monument to the military history of the United Kingdom. Designed by Sir Alexander Gibb & Partners, the Drakelow Tunnel Complex was excavated during World War II in sandstone hills near the village of Kinver and the town of Kidderminster, Worcestershire. It was originally constructed as a shadow factory for the Rover car company who were at the time manufacturing engines for the Bristol Aeroplane Company. The Tunnels were intended to supply components to Rover's main shadow factories at Acocks Green and Solihull, to supply spare parts, and to act as a backup facility if either of the main shadow factories was damaged by enemy action. The tunnels contained dormitories, storage areas, workshops, electrical equipment, toilets, offices, a BBC studio, a GPO Telephones communications facility and other facilities. It is said that a very mischievous Spirit by the name of Oswald like to make his presence known as he roams the tunnels, he has been known to pull hair and tamper and move peoples personal belongings. Oswald is thought to have lost his life in this very place as others did years ago in a terrible accident whilst at work in this dark underground maze maybe that is why there have been reports of strange Ghostly Phenomena from those few who have actually dared to enter this terrifying place. 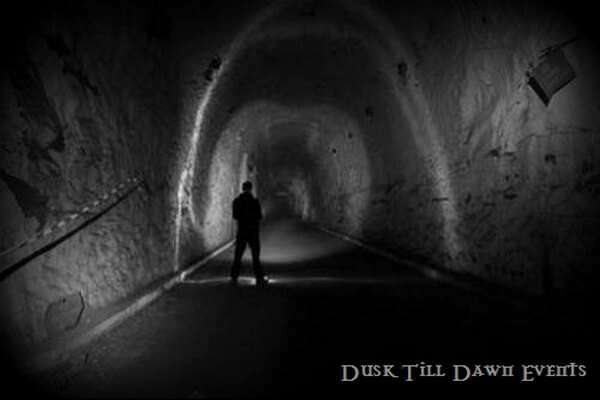 Dusk Till Dawn Events were first invited to visit this eerie location one dark night in October 2010 and were witness to footsteps, strange lights, muffled voices and a loud guttural moan in response to questions asked from an adjoining room which we all heard in the Hospital area of the Tunnels system. Join us if you dare for an unforgettable night as we shut out the light and Enter The Abyss! 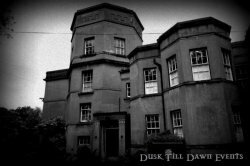 Tea and Coffee and Biscuits are provided for the ghost hunt by Dusk Till Dawn Events please feel free to bring your own hot-cold drinks and snacks. 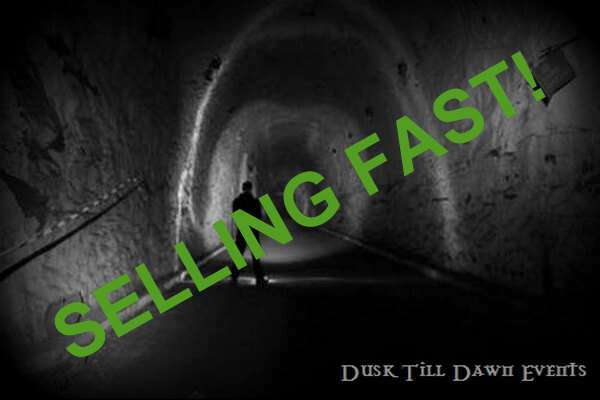 Should you wish to extend your night after the ghost hunt has finished at 3am - there is an option to sleepover in the sleeping area within the eerie Drakelow Tunnels. However please note - there are no suitable sleeping facilities, so please ensure you bring along a warm sleeping bag, bed roll, camp bed, air bed etc and pillow as you will require padding beneath you. If you choose the non-refundable deposit option, the final payment for this event will be required no later than the 9th October 2019. Optional sleepover time: 3:00am until morning. Please Note: Should you wish to extend your night sleeping over in Drakelow Tunnel after the ghost hunt has finished at 3am. Please ensure you bring along a warm sleeping bag, bed roll, air bed etc and pillow as you will require some padding beneath you. Please Note:Â Should you wish to extend your night sleeping over in Drakelow Tunnel after the ghost hunt has finished at 3am.Â Please ensure you bring along a warm sleeping bag, bed roll, air bed etc and pillow as you will require some padding beneath you. *If paying by Deposit please note the final payment for this event will be required no later than the 9th October 2019. ​*Prices are subject to change without notice see our Terms and Conditions for more information.